Can Vacation Improve Your Relationships? One of the main reasons people name for taking vacation is to strengthen relationships. What relationships are they talking about? Well, all of them, of course; new love interests, a family trip, a tenth-year wedding anniversary, or a vacation for just the guys or just the girls. Even when the stated goal has nothing to do with relationship building, it has a tendency to happen anyway, like trips taken by a church group, a conference for office workers, or a traveling sports team. You can probably think of a few more examples on your own. Unless you are traveling alone, some sort of personal interaction is going to occur on your vacation. New problems and challenges arise when away from home. When you solve them as a pair or a team, you wind up learning about one another and, quite often, coming to appreciate the talents of the other. The number of ways a trip can build relationships is endless. Simply spending time together can work well. When you engage in activities, however, the interactions increase. 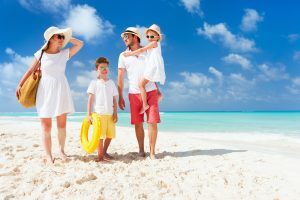 Let’s take a look at a few ways that you can have a great vacation here in the Clearwater Beach – St Pete Beach area while enhancing your time with your travel partners. We’re a vacation rental company, so, without blowing our horn too loudly, we recommend getting a comfortable place to stay like, well, a vacation rental. Self-promotional yes, but also true. When your group has a decent space to stay, attention doesn’t focus on how you will cope with your accommodations. From a one-bedroom cottage to a house that sleeps 14, putting everyone in one place can have a lot of advantages. A vacation rental with a living room where you can all gather at once is a fantastic bonus. Next comes your choice of activities. Spending time where you are staying and having meals out are the most obvious ways to be together as a couple, family, or group. While a meal out can turn into chaos under certain circumstances, a successful dinner on the town can do wonders toward getting to know one another. But let’s get to the things that our beach towns do best, and that’s providing tons of activities for visitors. A dynamic or complex activity can really help to build trust and let you know what your travel companion or companions are capable of, what they like, and sometimes where they draw the line. Activities that will put your vacation dynamics to the test could include riding bikes or scooters around the island, paddle-boarding trips, Jet Ski rentals or -our favorite -paragliding. All those activities push one boundary or the other, from organizing your team to facing your fears. You can build a relationship without pushing boundaries, though. Spending time doing mutually enjoyable activities works great. We recommend sunset boat tours, dolphin sighting tours, a ride on a bicycle cab, or -also our favorite -a day at the beach! Beach walks, catching a tan, swimming in the Gulf of Mexico, beach games, or checking out the gift shops are all things that can make your special someone or your group happy. If you really want to put your posse to the test, try making a sandcastle as a team. Take the personalities of your travel partners into account and make your choices accordingly. A family is going to partake in far different activities than a group from the office. Whatever choices you make, you will probably embark in a team building exercise without even meaning to. And, since you are on trip away from home, it’s probably going to be a lot of fun!